Some I know of are: various branches of the Adventist movement such as Advent Christians (Article XI in their Declaration of Principles), Seventh Day Adventists, and Church of God (Seventh Day); the Salvation Army; Jehovah's Witnesses; Christian Congregation (founded 1887 in Indiana); the Apostolic Christian Church (founded 1847 in Switzerland, with about 12,000 members in the U.S.); and the Christadelphians. I particularly admire the Salvation Army for their good works among the poor, and the Jehovah's Witnesses for their gentle but persistent witness. Both these groups are right out there visibly doing peace. (1) "A couple of Witnesses stopped by a few days ago and left the usual publications. I read through the part about shoplifting -- how marvelous! A religious group that actually addresses itself to ALL the parties involved, as if ANY of them might be reading and want some spiritual nourishment! Store owners, store workers, shoppers, shoplifters, would-be shoplifters, recovering shoplifters, adults, teens, kids, parents -- everybody! And of course there's the multicultural, multiracial illustrating style the Witnesses used long before it was mainstream." (2) ""Occupants of a car should avoid quarreling at all costs." So begins a short piece titled "Car Peace and Safety" in the June 22 issue of "Awake" magazine (published by Jehovah's Witnesses) p. 22. The article is quoting a German newspaper article, and goes on "The driver unconsciously becomes more aggressive in his driving, thereby increasing the risk of an accident.... Before starting off, it should be established how the front passenger can help with navigating, tuning the radio, or handling difficult situations."" What a concept! Car Peace and Safety! I love it! This little article really got me thinking. We all know that many more people are killed in the US and elsewhere in vehicular accidents than by murder or war, right? And yet if you do a google search on car safety, what do you get but gadgetry - rather than anything attempting to influence driver behavior. I just love the idea of thinking about "car peace" - getting along while in the car - avoiding accidents due to interpersonal conflict in the car, and/or driver inattention. The Hutterites, who date back to the same 16th C. Anabaptist movement which produced the Mennonites and the Amish. The Bruderhof Communities, a product of Hutterite contact with an early 20th C. German pietist/renewal movement. The Doukhabors, a Medieval Christian group thrown out of Russia and now in Canada. The Moravian Church, descendants of the Medieval Unitas Fratrum (United Brethren), who were clearly pacifist. Modern Moravians are not uniformly pacifist (some join the military), but they know this is part of their heritage and some desire to retrieve it. The Waldensians, a Medieval group still around in Italy which calls itself a pre-Luther Protestantism. No longer strictly pacifist, most Waldensians have a vague sense that they SHOULD be. The Stone-Campbell movement of the 19th C. U.S. Frontier began as pacifists. The liberal branch of that movement has become the Christian Church (Disciples of Christ). There is a large Disciples Peace Fellowship. The conservative branches of the movement, the Churches of Christ, and the Christian Churches, are today fundamentalist and largely militarist, but they were listed as peace churches in WWI and WWII with the government for conscientious objection purposes. Some conservative Campbellite historians are seeking to renew the peace witness. The Church of the Nazarene began as pacifist until WWI. Originally, most of the earliest Pentecostals were pacifist. Some Pentecostal scholars are attempting to revive this witness among the Assemblies of God, the Church of God (Cleveland, TN), the Church of God of Prophecy, and the (mostly African American) Church of God in Christ. 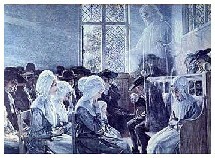 There is growing awareness that the 1st generation Pentecostals were theologically conservative, but socially radical: They crossed racial boundaries long before the end of Jim Crow; they reached out to the poor and disenfranchised; they allowed women great leadership roles in church (although their literalist interpretation caused them to still restrict women in the home) in a kind of biblicist semi-feminism; they were pacifist. "Young Turks" among Pentecostal ministers are attempting to revive all this--the biggest success so far has been a national repentance over caving into American racism 1 generation after the movement started and splitting into white and black denominations. They are holding merger talks and worshipping across racial boundaries, again. The Church of God (Anderson, IN), no relation to the Pentecostal denominations similarly named, is a revivalist denomination which grew out of 19th C. abolitionism and was originally pacifist. There is still a Church of God Peace Fellowship that has connections to the interfaith group, the Fellowship of Reconciliation. There are other peace church seminaries: Eastern Mennonite Seminary in Harrisburg, VA; Friends University in Witchita, KS; Friends Seminary in TX; Mennonite Brethren Theological Seminary in Fresno, CA; Ashland Theological Seminary in Ashland, OH ( a school of the Brethren Church, a more evangelical split from the Dunker movement that also gave us the Church of the Brethren). My own heritage, Baptist, is decidedly mixed. Originally, we grew out of radical 17th C. Puritans who met and were influenced by Dutch Mennonites (2 distinct branches), but the Baptist movement never adopted the Mennonite peace witness as a whole. Portions of the early Baptist movement were pacifist while other portions were decidedly militaristic. In the centuries since then, peace impulses keep arising in the midst of various Baptist bodies--often meeting resistance in those same bodies. A start at telling that heritage is Paul R. Dekar, For the Healing of the Nations: Baptist Peacemakers (Smyth & Helwys Press, 1993). I'm looking for suitable web links to add to this page, such as the Baptist Peace Fellowship of North America.